Working in a home office comes with different perks, no doubt about it, and it is becoming increasingly popular lately due to all the convenience it provides. In order for this space to be fully productive, there are several things that need to be continually provided. One of the most important preconditions for a productive atmosphere surely is the minimal level of noise. With this in mind, here is what needs to be done in order to attain an optimal noise reduction in your home office without breaking the bank. 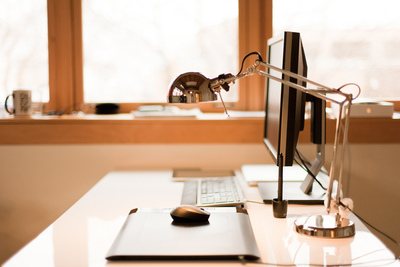 Among other concerns, the location of your home office is often the most important in terms of optimal noise reduction. For example, you may be living in the middle of the desert with no outside noise whatsoever and still have unsuitable home office when it comes to the level of noise if your home office is located at the center of all indoor activities. Therefore, when determining the area you will position your home office avoid the hectic parts of the house such as the living room, the kitchen and the dining area, as well as the vicinity of kids’ rooms and toilets. If feasible, chose the remotest part of the house. Just as it is the case with interior sources of noise, the location of the home office plays an important role when it comes to battling the exterior noise sources, as well. If it is possible, try to avoid positioning your home office in a room that is close to the most problematic outside noise sources, such as busy streets and noisy neighboring yards. This will make soundproofing a lot easier and more affordable. Dedicating due attention to location concerns will put you in a position to attain optimal noise reduction by performing small fixes instead of doing major construction work. If performed skillfully and on all problematic areas including doors, windows and any cracks that may appear on walls and ceilings, these small fixtures can be surprisingly effective. Naturally, they are way more convenient and significantly more affordable than any major constructive soundproofing work, not to mention faster and more practical. It goes without saying that windows need to be in top condition in order to provide soundproofing of the outside noise. They need to be perfectly installed and absolutely no cracks in the glass or window frame are allowed. If all of this is in perfect order and you are still not fully satisfied with the level of soundproofing, installing retrofit double glazing on your existing windows would be the optimal budget-friendly solution to facilitate your noise reduction efforts. When functional doors are about, the largest concern is their bottom since that is where the most of the noise comes in. A cut-to-measure cover will fix this problem efficiently. Further improvements can be made by placing a suitable type of weatherstripping along the sides of the door to additionally reduce the noise. If all of this does not solve the problem, you will have to replace the existing door with a solid wood one which is particularly successful at reducing noise. The source of noise may come both from above and below your home office. If this is the case, soundproofing of ceiling and flooring is the recommended solution. When it comes to ceiling, adding a soundboard or attaching a single or double sheet of drywall will significantly improve things. When flooring soundproofing is concerned, using a thick carpet or a rug will usually be enough. If not, slip sound acoustic boards underneath them and enjoy the silence. Implementing all of these affordable soundproofing steps guaranties that you will have a perfect home office setting with an optimal noise reduction regardless of where the main source may be. And all this without any major construction works or delays and investments caused by them.